Well...I have been in Beijing for almost 2 weeks and it is time for me to leave tomorrow morning. As much as I am looking forward to getting home to the wife, the kids, the dog, American food and drinkable water, I am also sad that I am leaving before the games are over. On my last day, I did get a chance to shoot the woman's synchronized diving competition. Shooting this event was exciting and humorous at the same time. The building would be very quiet while the athletes would prepare for their dives, and then just as they make their jump, I would hear the shutters of 50 cameras (mostly Canon 1D Mark IIIs which can shoot 10 frames per second) bursting away as we followed the divers until they were completely in the water. This same sequence would happen every minute or so. 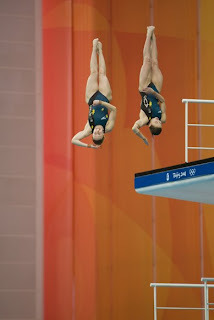 It was really amazing to see the divers symmetry through a camera, when reviewing the images after each jump. I have no idea how the judges could see all of this in less than 3 seconds. The American team did not do very well at this sport, but the Australian's grabbed silver. As good as the Aussies were at this sport, the Chinese dominated. Now that I was done shooting this event, it was time to leave the Olympics grounds for the last time and head back to the hotel to pack. 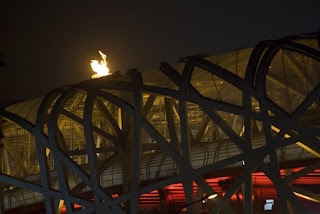 As I was leaving the grounds, I took one last look behind me and shot this picture of the Olympic torch above the Birds Nest. This is not my best image, but it has a lot of meaning to me, as my last Olympic image, after shooting more than 15,000. Goodbye Beijing and thank you for making me at home for the last couple of weeks. This has truly been an amazing experience that I will never forget. J.M.C. Olympics in Beijing - Opening Night! Olympics in Beijing - Opening Day!